It’s my favorite Dukes of Hazzard moment. I was in First Grade, and “The Dukes” were just about the most popular thing in the world. Maybe tied with Michael Jackson’s Thriller album. 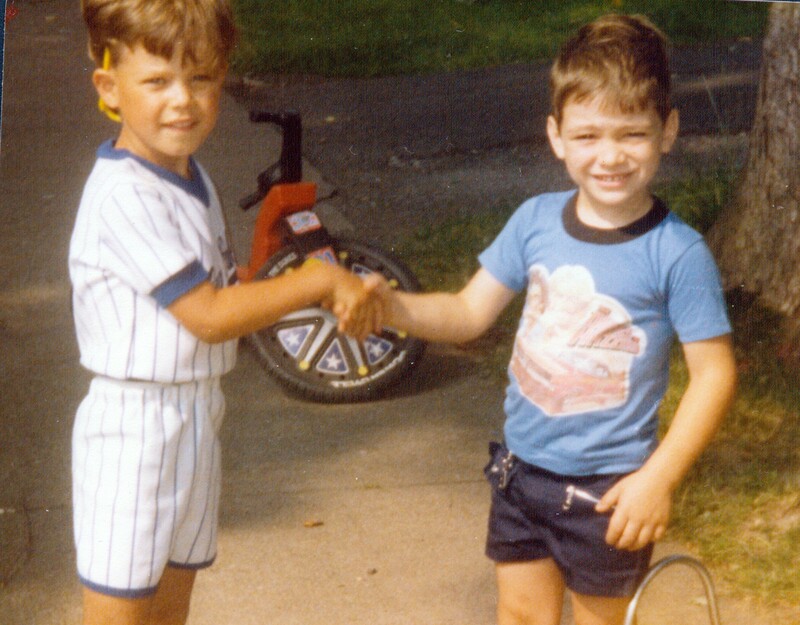 The early ’80s were a tough time in South Buffalo– and my dad had a tough time finding work. 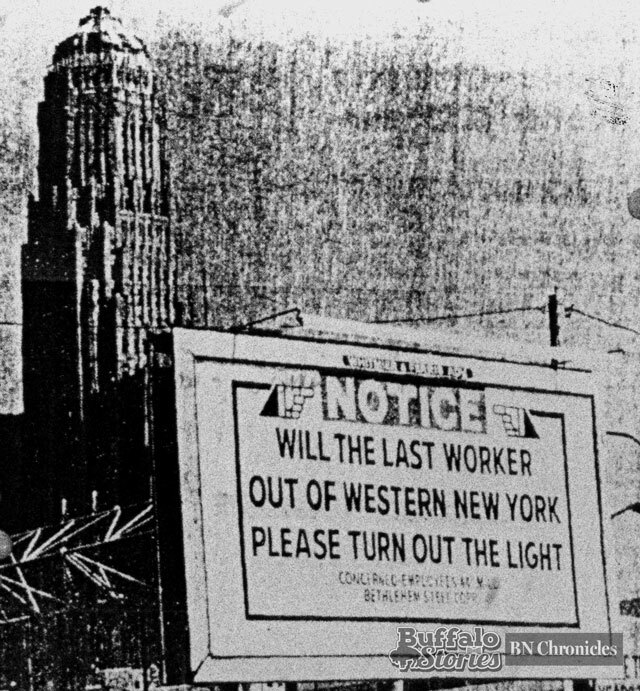 Billboard outside of City Hall in the late ’70s, placed there by Bethlehem Steel’s union workforce. Plants closed and he sold the bar at Elk & Smith. He tried teaching middle school history but couldn’t get in full-time, so he lived and worked in Massachusetts for almost a year while we lived on Allegany Street off Tifft near South Park. Of course we missed dad– and money was tight. There were more 20-cent letters flying than $5 long-distance phone calls being made. I can’t imagine what it was like for my ol’man to be away, and for my mom to be home with us three, a full-time job, and no car. It was a Friday night and we took our baths early to be ready to watch those Duke boys. We were sitting at our little plastic table in the living room—all ready for “Tic-Tac-Dough” and “Jokers Wild” to end and Waylon Jennings to sing about “two good ol’boys, never meaning no harm…” when the front door burst open. 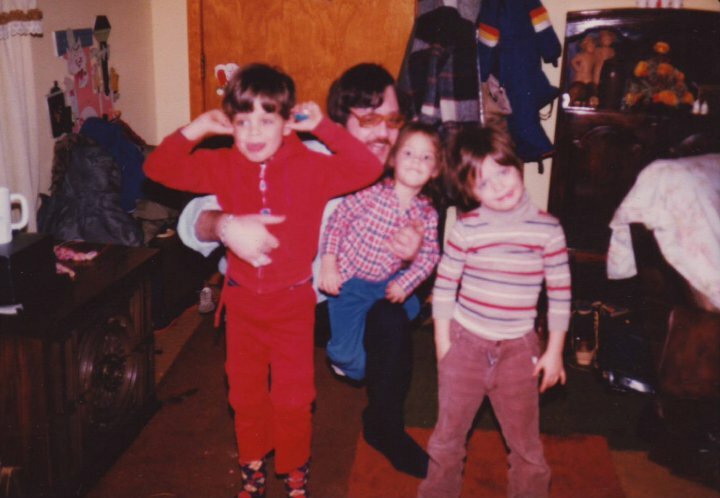 Dad with us kids just inside the front door of our house on Allegany Street…. probably taken just as he was leaving for Massachusetts one time or another. Not only had my ol’man pushed our AMC Spirit to the limit speeding home from Massachusetts, but he had the sense to stop at Mineo’s South (when it was on the corner of Tifft & South Park) on his way home to pick up a large pie. Pizza, like long distance calls, wasn’t often in the budget and extra special. I’m not sure a six-year-old heart could be any more full. This glorious Friday night was probably about the best night of my life up until then… Dad was home, we were eating pizza, and we were watching the Dukes. All was right with the world. The item that was “The Red Ryder b-b gun” of my youth has now been branded as hateful. When I rode my “Dukes of Hazzard” big wheel around the streets of South Buffalo as a 6 and 7 year old, the Dukes stood for what is right and wonderful in this world. 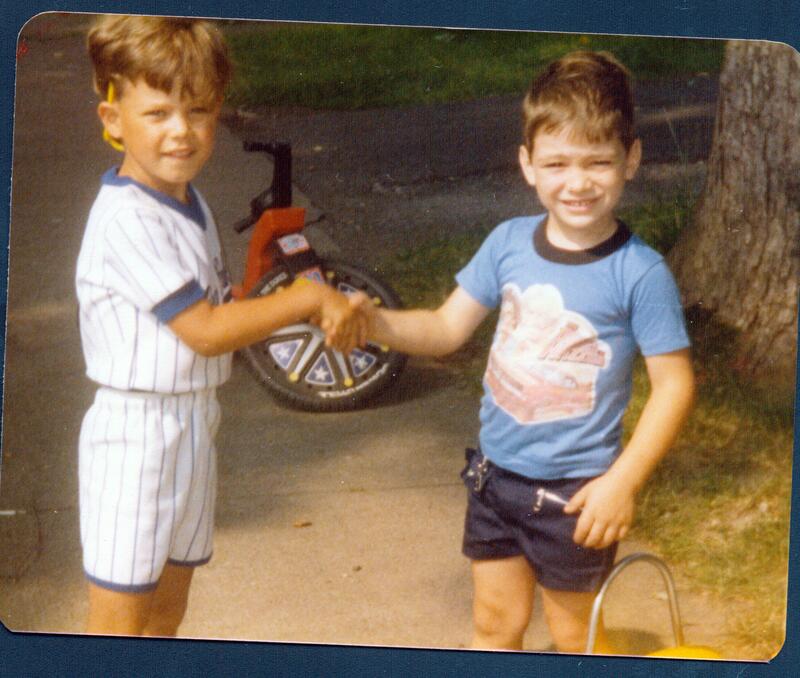 That’s me (left) with my Dukes of Hazzard big wheel, c.1982. Note the rebel flag sticker just above the shaking hands. Of course, in the years since cruising down Allegany Street in the saddle of my orange plastic pride and joy, I’ve given plenty of thought to the meaning of that flag. First I’ll say seeing it fly makes me uncomfortable. But I’ll also say, I’m certain there are many who have displayed that flag who are not racist. I’m also certain that not everyone who has displayed the flag has done so with the thought of doing so as emblematic of racism or a racist culture. I honestly and earnestly believe that the familiar rebel flag offers many folks a feeling of connection to ancestors and a sense of pride in history. But when you fly a flag… or put a bumper sticker on your car… you are allowing a symbol to represent you, and symbols always have nuanced meaning for every individual under the sun. Many of us all have a visceral reaction and likely pass immediate judgement about people who put those place oval stickers on their cars. What might be true of someone who likes Key West? The Outer Banks? Ellicottville? How about a Yankees bumper sticker? Or a Vote Bush sticker? Or a Vote Obama sticker? How about MD physician plates on a Honda Civic? MD plates on a BMW SUV? A rubber scrotum hanging from the tow hitch? It’s fair to say that each of these different instances will cause different reactions in each one of us. It’s also fair to say that each of these reactions were created by someone making a choice on how to present themselves in public. Generally, I know my reaction to someone flaunting the rebel flag is a negative one. Regardless of what the symbol means to that person inside, I wonder how they can offer that symbol up as representative of who they are– when we all know for so many people it means little other than backwards racism. But here again, I understand the dichotomy, as I warmly remember the care-free summers I spent cruising around my neighborhood, my ride emblazoned with what is now an official symbol of hate. I’ve been blessed with fathers in my life. I was lucky to have the best dad that anyone could ever ask for; which is what every son and daughter created in their old man’s image will say. I mean how can I not: from my stubby fingers, to untold numbers of personality traits both wonderful and not-quite-as wonderful, I’m a spitting image of my dad in so many ways, how can I deny it? I’ve written a lot about my dad. Click on “The Ol’man” in the word cloud and you’ll see plenty about him. I love and miss my dad every day, but what I’d like to talk about today is the other fathers in my life, and I’m lucky to have and to have had many. I’m so blessed to have enjoyed the love and care of three grandfathers. First, Stephen Julius Wargo, my great grandfather, after whom I was named. My mom’s grandpa. He lived a few blocks away from us, and when I had to go home for lunch in first grade, I would occasionally bring a can of chicken noodle soup over to Grandpa W’s house for us to share, with enough left over for his dinner. He also famously fixed my Dukes of Hazzard big wheel, when the piece between the handlebars and the big wheel broke. I sadly dragged the pieces down to his house, but triumphantly rode my orange plastic treasure home a week later. He was always smiling, kind of a troublemaker, and happy that as a revered old guy, he could get away with it. Like on Christmas, when he wouldn’t fully open a gift; but would only lift up the edge of the paper to see what was in there. A master aggravator! Jimmy Coyle was my mom’s dad. He took over sending out cards and such after my grandma died, and I know I got at least one signed “Jimmy Coyle” from gramps. A big strong man, Gramps was the old fashioned kind of strong silent type that you might see in the westerns that he loved. When I was little, and we’d be there for dinner, he’d come home from work, and within moments be sharping the big knife in anticipation of carving up the big roast beef that Grandma just pulled out of the oven. I always felt an extra compulsion to behave and eat everything on my plate, with my regular seat next to Gramps. We would often be at Grandma and Grandpa’s house the night he did grocery shopping, and he would buy a special treat for us for ‘helping’ put away the groceries (I was no more than 5 or 6, and I’m the oldest… So I don’t think we were much help.) It was usually green Chuckles (like the spearmint jelly candies) and we earned ’em. I also remember going with him in his old green jalopy of a pickup truck (it was actually a van with the back some how cut off) to the hardware store, where I can remember him using his old wooden fold out measure to see how much wood he needed. I don’t think he ever used a metal measuring tape. As we all got older, you could tell how satisfied Gramps was when his house would fill on holidays. One of his last great thrills though, came on one of his saddest days. On the day of Grandma’s funeral, he took ‘all of June’s gambling money,’ and funded an impromptu Irish wake at a hole in the wall bar. He had so much fun drinking and really just hanging out with his kids and especially his grandkids, he talked about it with a smile until the day he died. I’m blessed that Grandpa Cichon is still as loving and lovely a man you’d ever meet at the age of 85. If the world had a few more people like Eddie Cichon, there’d be fewer coupons to go around, but a lot more happiness and love. Gramps always delighted in whatever kids were around, especially any of us 20-something grandkids. When we were small, he’d take us to the park, and sit and watch us play until we wore out. One of his classic lines, Go catch grandpa a bird, would leave us kids sneaking up on birds seemingly forever. We never caught one. Dinner was a little different at Grandma Cichon’s. The table was completely set, everyone was in place, waiting for Gramps to get home from work. His seat was a direct shot from the front door, he’d sit right down, say the fastest grace on record, ‘BlessLordGiveBoutToReceiveChristLordAmen,’ and quickly add a ‘OK, let’s eat.’ And eat you did with Gramps. A child of the Depression, he clipped coupons, and stored them under a couch cushion. He’d try to use expired ones. And he’d buy it whether he needed it or not. “But Huns,” he’d tell Grandma, “It was on sale.” Then he’d try to make you eat it or take it home. For as hard a time as I have had with my Dad’s death, poor gramps not only lost a son, but a best friend. My dad used to bring him donuts to the nursing home whenever he’d visit. It had probably been at least a year since he had one, when I brought two up a few weeks ago. He’s blind, so when I told him what a I had there with me, he said, with all the gravity and earnestness you can imagine, ‘Stevie, donuts are as good as gold.’ And there’s no doubt he meant it. September 29, 2001, I some how shanghaied my beautiful wife into saying ‘I do,’ and I gained not only a wife, but a whole family. I don’t even like referring to Howard Huxley as my father-in-law, because father is really enough. He’s probably tearing up reading this, and that’s what I love about him. He loves his family, and loves and appreciates that his family loves him. He’s really the ultimate proud parent, traveling to just about everyone of my brother-in-law’s baseball games. And the games were an hour and a half away, at night, and he had to be up for work at 3am. And just this week, he was there shooting video of my well-into-her 30s wife, as she took the slide into Jell-O for charity, with no less excitement than when he was there taking pictures at her 1st grade dance recital. I know it’s tough on him that his other daughter and granddaughter are in Florida, but it really makes the times we’re all together that much more special for him and all of us. Personally, I’m thankful and blessed that all this love and pride has extended to me, too. Howard’s my biggest fan, showing up to all my silly events, always listening to the radio, and just being a good guy, good friend, and good dad. Growing up, I also became close with the fathers of a number of friends, like Bob Cohen, the late Dr. Fanelli, and Don Brindle. Each of them cared for me not only like the friend of a son; but like a son, and I them like a parent. I think I’ve made it pretty clear that I think Fathers Day is about more than just biological dads. We actually call our Catholic priests ‘Father,’ and two in particular have meant the world to me. Fr. 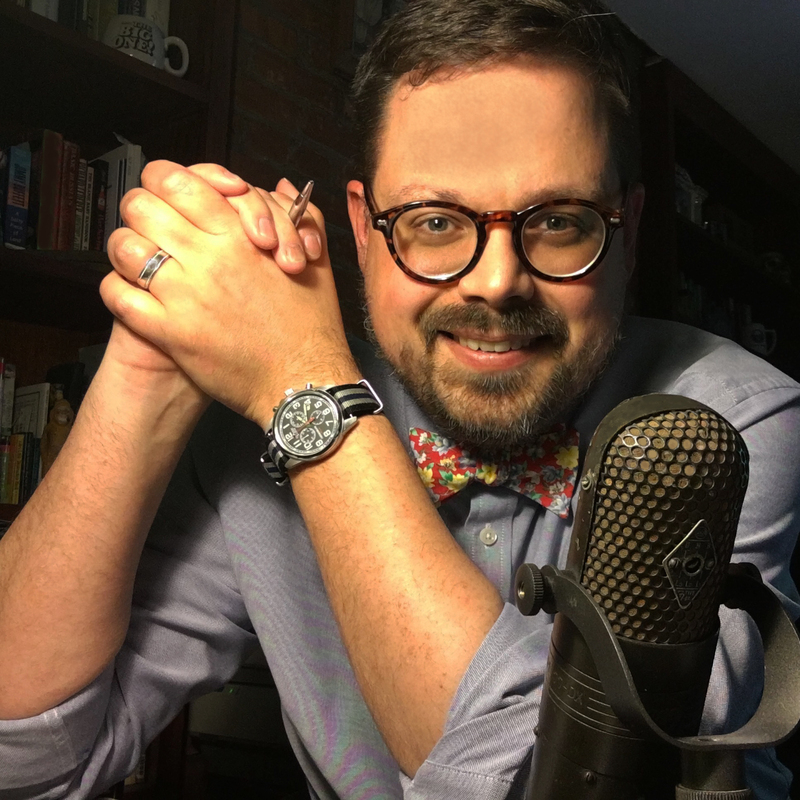 Braun was the pastor at my church, so it’s pretty clear how he came into my life. But it’s a little less clear how Father John Mack did. He is the little angel who sits on my shoulder,and helps shine the beacon of Christ’s love into places I didn’t know existed. Of course the big guy, the Father of all men, is also someone that I have to be thankful for; for blessing me with all these great men and great memories and great hope for the future.